Production: Universal Pictures; Technicolor, 35mm; running time: 99 minutes. Released 1956. Filmed November 1955-January 1956. Producer: Albert Zugsmith; screenplay: George Zuckerman, from the novel by Robert Wilder; photography: Russell Metty; editor: Russell Schoengarth; art directors: Alexander Golitzen, Robert Clatworthy, Russell A. Gausman, and Julia Heron; music: Frank Skinner and Joseph Gershenson; special effects: Clifford Stine; costume designer: Bill Thomas. Cast: Rock Hudson ( Mitch Wayne ); Lauren Bacall ( Lucy Moore Hadley ); Robert Stack ( Kyle Hadley ); Dorothy Malone ( Marylee Hadley ); Robert Keith ( Jasper Hadley ); Grant Williams ( Biff Miley ); Harry Shannon ( Hoak Wayne ); Robert J. Wilke ( Dan Willis ); Edward Platt ( Dr. Cochran ); John Latch ( Roy Carter ); Joseph Cranby ( R. J. Courtney ); Roy Glenn ( Sam ); Maide Norman ( Bertha ). Awards: Oscar for Best Supporting Actress (Malone), 1956. Halliday, Jon, Sirk on Sirk , London, 1971; New York, 1972. Bourget, Jean-Loup, Douglas Sirk , Paris, 1984. Althen, Michael, Rock Hudson: Seine Filme, sein leben , Munich, 1986. Hudson, Rock and Sara Davidson, Rock Hudson: His Story , London, 1986. Quirk, Lawrence J., Lauren Bacall: Her Films and Career , Secaucus, New Jersey, 1986. Gledhill, Christine, editor, Home Is Where the Heart Is: Studies in Melodrama and the Woman's Film , London, 1987. Läufer, Elisabeth, Skeptiker des Lichts: Douglas Sirk und seine Filme , Frankfurt, 1987. Fischer, Lucy, editor, Imitation of Life: Douglas Sirk, Director , New Brunswick, 1991. Parker, John, Five for Hollywood , Secaucus, 1991. Scott Royce, Brenda, Lauren Bacall: A Bio-Bibliography , Westport, 1992. Scott Royce, Brenda, Rock Hudson: A Bio-Bibliography , Westport, 1995. Marcorelles, Louis, "Le Film gratuit," in Cahiers du Cinéma (Paris), March 1957. Hagen, Ray, "Lauren Bacall," in Films in Review (New York), April 1964. Brion, Patrick, and Dominique Rabourdin, "Biofilmographie de Douglas Sirk," in Cahiers du Cinéma (Paris), April 1967. Comolli, Jean-Louis, "L'Aveugle et le miroir; ou, L'Impossible Cinéma de Douglas Sirk," in Cahiers du Cinéma (Paris), April 1967. Daney, Serge, and Jean Louis Noames, "Entretien avec Douglas Sirk," in Cahiers du Cinéma (Paris), April 1967. Halliday, Jon, "Sirk on Sirk," in Cinema One (London), no. 18, 1971. "Sirk Issue" of Screen (London), Summer 1971. Bourget, E., and J. L. Bourget, "Sur Douglas Sirk," in Positif (Paris), April and September 1972. Willemen, Paul, "Towards an Analysis of the Sirkian System," in Screen (London), Winter 1972–73. Stern, M., "Patterns of Power and Potency, Repression and Violence," in Velvet Light Trap (Madison, Wisconsin), Fall 1976. Mulvey, Laura, "Douglas Sirk and Melodrama," in Australian Journal of Screen Theory (Kensington, New South Wales), no. 3, 1977. Mulvey, Laura, "Notes on Sirk and Melodrama," in Movie (London), Winter 1977–78. Honickel, T., "Idol der Münchner Filmstudenten: Douglas Sirk weider in der HFF," in Film und Ton (Munich), February 1979. Place, Janey, in Magill's Survey of Cinema 4 , Englewood Cliffs, New Jersey, 1980. Orr, Christopher, "Closure and Containment: Marylee Hadley in Written on the Wind ," in Wide Angle (Athens, Ohio), vol. 4, no. 2, 1980. Interim, L., in Cahiers du Cinéma (Paris), November 1981. Schmittze, A., in Cinématographe (Paris), December 1981. Courant, G., in Cinéma (Paris), January 1982. Wegner, H., "Melodrama as Tragic Rondo: Douglas Sirk's Written on the Wind ," in Literature/Film Quarterly (Salisbury, Maryland), July 1982. Tobin, Yann, in Positif (Paris), September 1982. Orr, Christopher, " Written on the Wind and the Ideology of Adaptation," in Film Criticism (Meadville, Pennsylvania), Spring 1985. Klinger, B., "Much Ado about Excess: Genre, Mise-en-Scène and the Woman in Written on the Wind ," in Wide Angle (Baltimore), no. 4, 1989. Bibby, Bruce, in Premiere (Boulder), vol. 3, no. 11, July 1990. Babington, B., and P. Evans, "All That Heaven Allowed," in Movie (London), Winter 1990. Reid's Film Index , no. 7, 1991. Graham, Don, in Texas Monthly , vol. 19, no. 7, 1991. Kennedy, Harlan, in American Film , vol. 17, no. 1, January-February 1992. Walker, M., " While the City Sleeps ," in Cineaction (Toronto), Fall 1992. Mulvey, Laura, in Sight & Sound (London), vol. 8, no. 2, February 1998. The story of the oil-wealthy Hadley children can be seen as the archetype for decades of melodrama to follow: The abject alcoholic Kyle and his trampy bleach-blonde sister Marylee are beautiful, filled with implacable longing and despair, and drive great cars. The stage is set for a sordid wedding of eros and thanatos by Universal's "Stairway of the Stars," which sits grandly in the centre of the Hadley mansion. (The "stairway" is alleged to have a 30-year screen history and is seen later in Hitchcock's Marnie , 1964.) The story of Kyle's doomed-to-fail marriage to sensible Lucy Moore is complicated by much gun-waving, bar-brawling and, clothing-changing, as well as Marylee's lusty passion for her brother's best friend, nature-boy Mitch Wayne (who experiences feelings of a purer sort for Lucy). 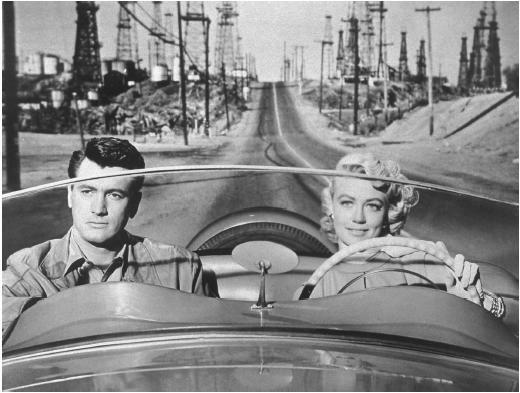 Written on the Wind opened to a New York Times (1957) review that characterized the actors' performances as "absurd" and criticized the plot, where "nothing really happens" and the central character as "sloppy, self-pitying, and a bore." But in the years that have elapsed since its premier, it is precisely these characteristics that have transformed the film into a critical darling. The rise of director Sirk's reputation as an author , the influence on film theory of German dramatist Bertolt Brecht's ideas, and the appropriation of psychoanalysis by film scholars have made Written on the Wind a central text for feminist and genre critics. There is no firm consensus on the film's status as a powerful critique of patriarchal capitalism, but few would dispute its canonization as an enduring camp classic that solicits both laughter and tears—often in the same moments. Hard-working city girl Lucy marries Kyle after he reveals his troubled lineage and self-loathing on an airplane ride above "the big poker table." ("Down there I'm a guy with too many chips. Throw'em up in the air and a few end up on my shoulders.") But the gun that Lucy finds under his pillow on their honeymoon is much smaller than the double-barrel shotgun Mitch totes around. "Let's call it a weakness," suggests Doctor Cochran when Kyle inquires about his lack of success in producing a Hadley heir, and his sense of his failed masculinity increases exponentially. Meanwhile, Marylee engages in various stunts to capture Mitch's attention (among other things), all of them unsuccessful but highly entertaining to watch (especially in the light of queer readings of Rock Hudson's performance). Marylee gives her long-suffering father a heart attack when police find her in a motel room tryst with a gas station attendant and, in perhaps the most cinematic patricide Hollywood ever produced, she dances wildly in her room as he plummets down 48 stairs to his death. These two plot trajectories converge when Lucy becomes pregnant and Kyle, thick in the drunken haze into which he descends after learning of his "weakness," suspects that it is Mitch's baby. Kyle hits Lucy and causes her to miscarry. This incurs the wrath of Mitch, whose shoulders seem even wider than Joan Crawford's when he bellows her line from Mildred Pierce (1945), "Get out before I kill you!" Unfortunately for Mitch, this crack in his otherwise stoic veneer is key to implicating him in Kyle's subsequent death. Marylee's first and final act of "goodness," revealing Mitch's innocence at his murder trial, leaves Mitch free to go away with Lucy and leaves Marylee alone, sitting behind her father's desk in a drab grey suit, caressing a miniature oil derrick. Early critical interest in Douglas Sirk focused on his expressive mis-en-scène: the affective use of decor and costuming, dramatic framing and lightning, and links to painting and music. These are all clearly significant elements in Written on the Wind , where a highly authentic recreation of the "21 Club" is juxtaposed with ridiculous rear-projections and back-drops, and characters are surrounded by eerily coloured walls and mirrored surfaces. But discussion beyond these arenas was minimal until almost ten years after Sirk's last Hollywood film ( Imitation of Life , 1959). An increased enthusiasm for his films (particularly the Universal melodramas, c. 1954–59) was fuelled by new ideas about understanding contradiction-riddled Hollywood films as ripping themselves apart at the seams: blatantly artificial acting, garish stylization and implausible plot lines became the hallmark of a self-conscious, subversive cinema. Such a reading of Written on the Wind was encouraged by Sirk himself, who worked with Brecht in the German theatre and believed in his principles (hinging on the idea of audience distanciation which results in detached intellectual analysis rather than emotional catharsis). An eloquent expositor of the theories behind his films, discussing his intentions in an age where authorship mattered, Sirk drew a meticulous road map by which the convoluted paths of his films could be followed and understood in a politically progressive way. But regardless of Sirk's intellectual predilections, the man who is reported to have once said, "Cinema is blood, tears, violence, hate, death, and love" was never one to make an academic film. At the end of Written on the Wind , we are left with the memory of Kyle's voice as he wraps his arms around his knees and cries, "I don't even love myself," and the images of amber liquor thrown against a mirror, the black bow of a funeral wreath as it blows across an empty driveway, and Marylee's diaphanous pink negligee swirling about her suntanned legs. German filmmaker Rainer Werner Fassbinder writes, "For Douglas Sirk, madness is a sign of hope, I think." If Fassbinder was right, then the true tragedy of Written on the Wind lies not in its characters' excesses, but in their apparent "normalization." Mitch and Lucy may "escape" from the Hadley household, but it is at the expense of the only people who ever really knew what was wrong with it. Why is the theme song of "written on the Wind" no longer played in the movie that we see on TV? It's one of my favorite songs and I miss it. I don't watch reruns anymore because the song is missing. An excellent film. Dorothy Malone was marvellous. Cinemax is showing Sirk's films during Jully 2007. Rock Hudson and Robert Stack were very well acting and I'd Like to know the name of the bartender since he appears in more than 100 films like secondary actor, specially westerns.